I was a bánh mì virgin. I'd heard all about these sandwiches (a fusion of Vietnamese and French influences) but until recently they'd remained on my gastronomic "to do" list. Craving something different and wanting to try something new, I headed to Buford Highway to sample my very first bánh mì. 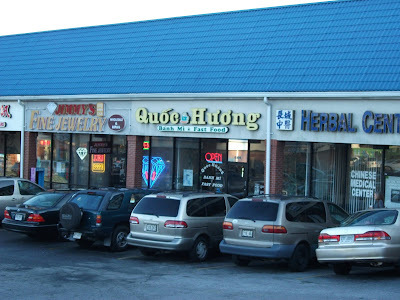 Previously recommended by The Blissful Glutton, EatBufordHighway and Food Near Snellville (whose opinions I value), I decided to visit Quoc Húóng. I opted for the BBQ pork bánh mì (bánh mì thit nuong) to go. Only $2.50 for this sandwich? Are you kidding me?! WOW. That first bite really was like an explosion of flavors and textures: the perfectly crusty baguette, the crunch of the carrots and cucumber, the spicy kick of the fresh jalapeno, the sweet dressing and savory BBQ pork. I know the whole "explosion of flavors" bit sounds kind of cheesy, but that's just the description that comes to mind. 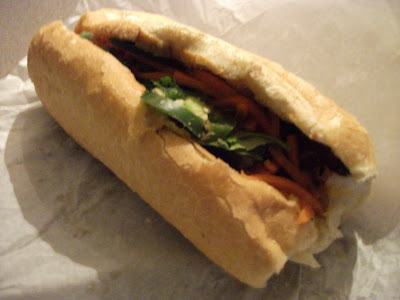 This bánh mì newbie became an instant fan. The $2.50 price tag made me even happier-this is a steal. There are other spots for bánh mì on Bu Hi that I still have to try, but Quõc Húóng will be one of the places I will return to again and again. Glad you liked it - still one of my favorites! I was daydreaming about that bành mí the following day at work...it was so good! I'm looking forward to trying some of the other bành mí spots on Buford Hwy. So glad you've joined us!! This is such a great cause!